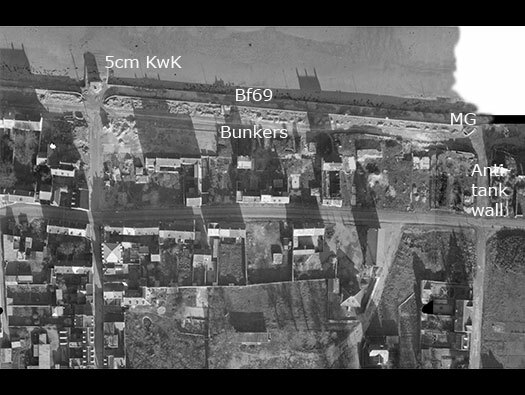 Wn26 Langrune-sur-Mer, K.V.U.Gr Riva-Bella, K.V.Gr Caen. 1 x Ringstand 1694-type with concrete roof. 1 x 69-type mortar ringstand. 1 x 5cm KwK L/60 Pak. Ringstand 1694-type with concrete roof. 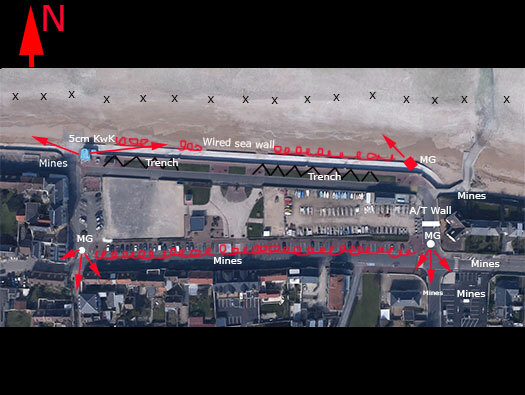 Plan of the defences where the main defence was the section of the town boarderd by the sea front and the first lateral road. A frontage 240m x 60m. 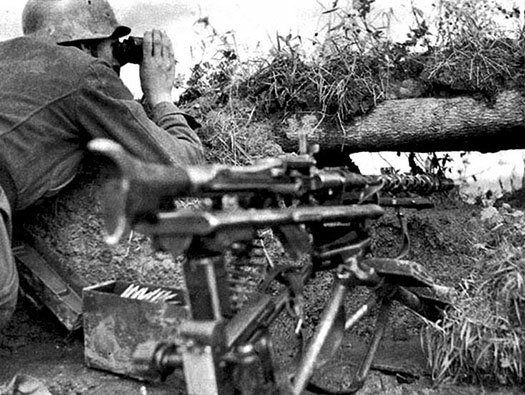 The whole perimeter was wired in and a minefield with anti-tank and ant-personnel mines. One 5cm KwK, an 8.14cm mortar and a double opening pill box for machine guns. On the flanks were four small machine gun pill boxes probably all built by the platoon that were stationed here. made out of local materials and anything they could borrow from the Todt Org. 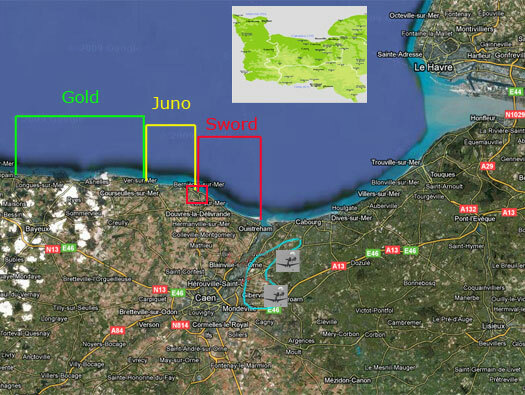 the main builders of bunkers in France. Down the eastern road was an anti-tank wall 10ft x 4ft with a machine gun covering the rear areas and the western road also another machine gun and the 5cm KwK which could also fire down this road able to fire E, S and W. There were several small concrete bunkers uses as living accomadation and maybe the odd cellar. Any windows that were facing out of the defence would have been bricked up and places for machine guns and rifles left open. 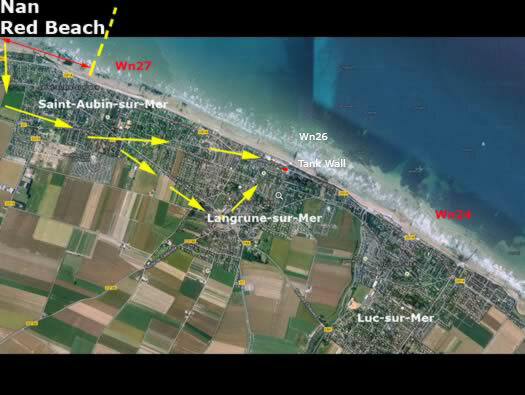 Wn26 Langrune-sur-Mer with Wn's 25,24 & 27. MF54 'Mine field' covering the beach area. Yellow writing on the sign would mean it was a dummy mine field. Fire from inland batteries could be called down onto the beach. Using the code word 'Koln' the gunners could quickly look up the details of the target, dialing the ranges and compass direction and within seconds four shells could be sailing through the air. 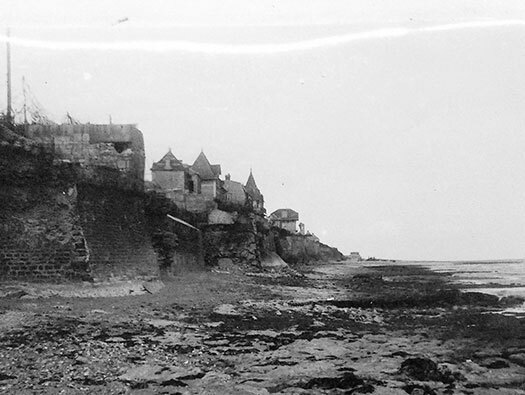 The defence of Langrune was a linear defence running for quite a long way along the sea front, with machine gun posts, a mortar and a 5cm KwK gun. Several houses were also strengthened. A beach landing would be very hard here due to a high seawall running its full length. 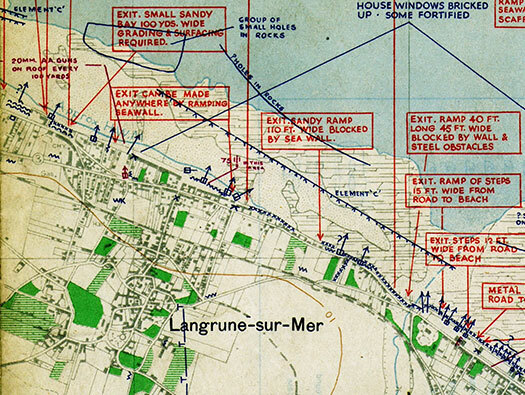 The landings happened far to the left and right and Wn26 Langrune-sur-Mer was taken by Commandos on D+1. The sea wall at Langrune. A shell set into the concrete, when a boat hits the wooden stake, a striker plate will hit the shell and it will explode. The only pillbox/M.G. stand left here. There was two. A closer look at the M.G. stand. A closer look at the M.G. stand. Made from local materials and reinforced concrete. Looking back from Langrune-sur-Mer towards Luc-sur-Mer. Plan of the main defence layout around this block of houses all now removed. Wire along the sea front and along the top of the rear wall. Mines all around and beach defences in the water. 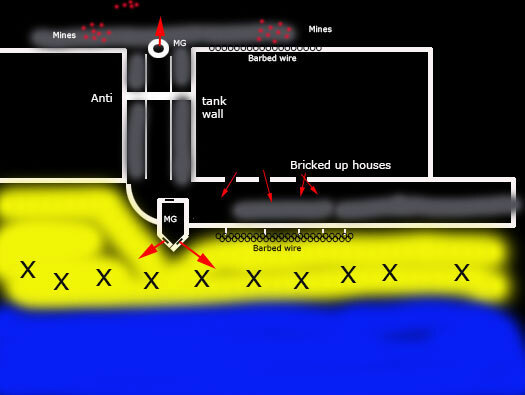 Plan of an anti-tank wall. 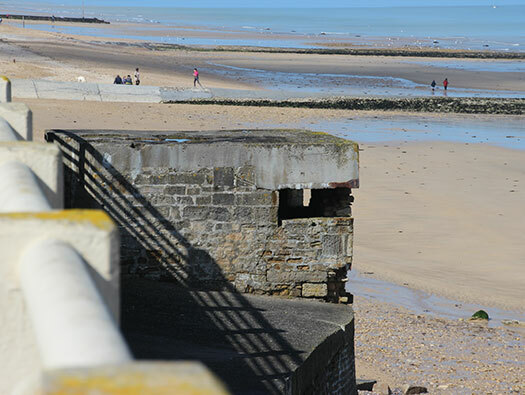 One of the beach exits with a defended pillbox to he right (MG). 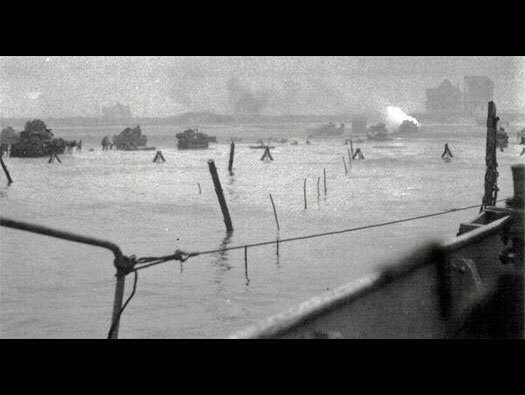 The houses along the front took quite a battering on D-Day morning from naval artillery. 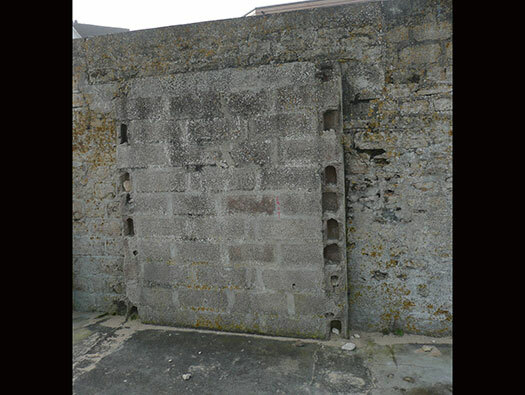 The defenders bricked up the windows and left a small slits to fire machine guns and rifles through. 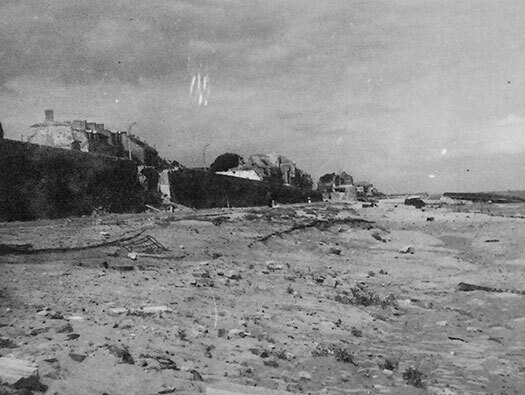 One of the beach exits with a defended pillbox to he right. 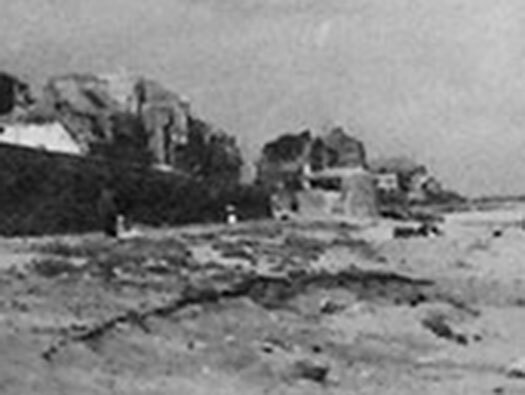 The houses along the front can be seen here battering by the naval artillery bombardment. Eastern side of the defence. 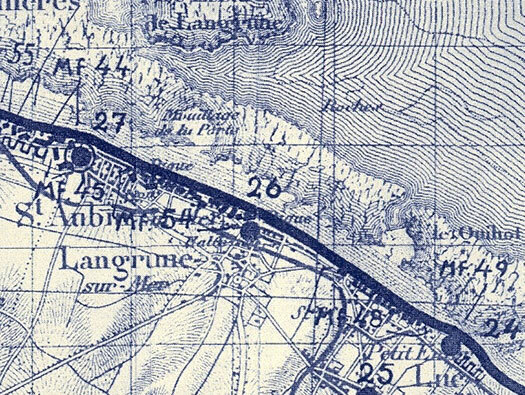 Plan of this area showing the MG strong point and the barbed wire along the sea wall. 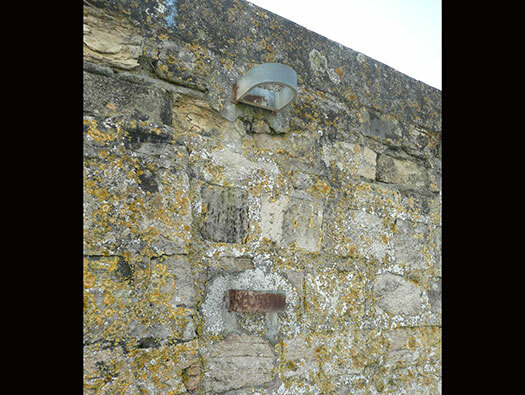 Two brackets fitted to the sea wall to hold wooden posts to carry barbed wire all the way along the front. 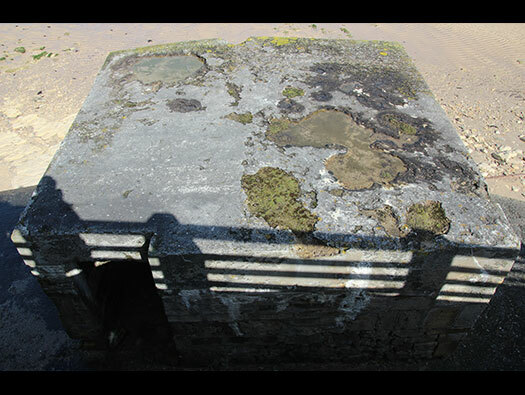 The marks in the concrete are the remains of the pillbox that was here. 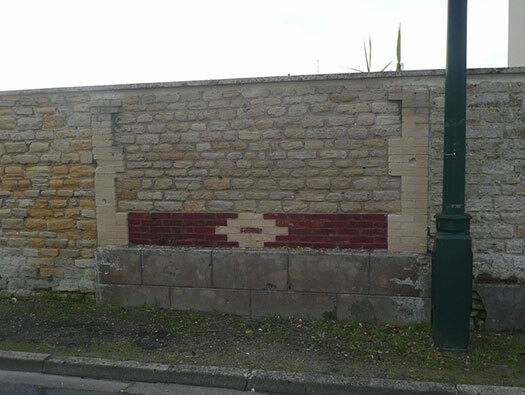 The rear wall of the pillbox. A mortar Tobruk sat around here in a Bf.69 emplacement with a mortar team. They would have consisted of a team of around four to five men with one being a corporal in charge. Fire orders would come from look out positions along the Wn or even from neighboring Wn's by a land line field telephone. One of the crew, probably the corporal may have used the smaller Tobruk as a lookout spotting for the gun. 69-type.mortar ringstand from the air showing the Tobruk for a machine gun and observation and the larger for an 8cm Mortar..
A mortar section in action in a field position. The Commandos complained about being bombarded by mortar bombs. Brandt 8.14cm Gr.W 278(f) mortar. 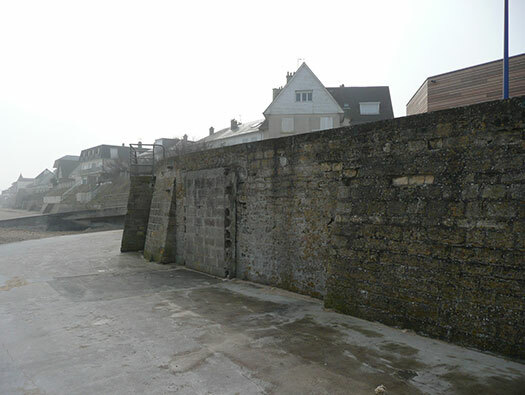 View along the beach front at the sea wall with the 5cm KwK in its protected ringstand. A closer view of the ringstand. 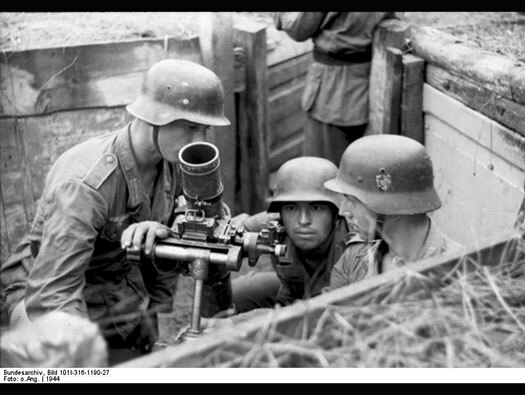 5cm KwK with gunner in place. 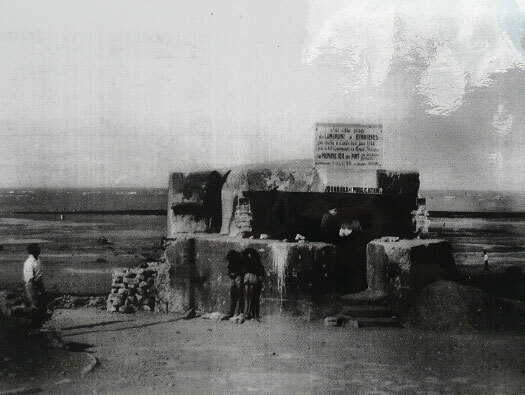 The 1694-type ringstand just after the war. Elevation plan of this casemate/ringstand. The 1694-type ringstand with a lot of shell splatters against the emplacement. 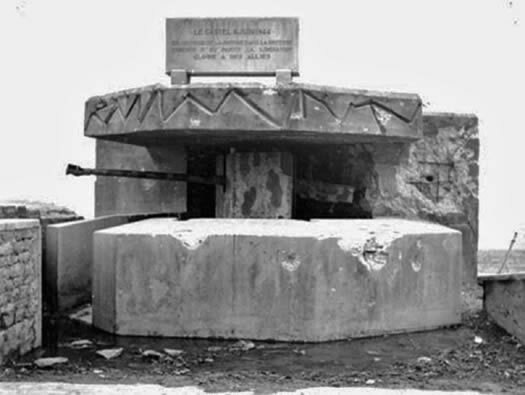 The 1694-type ringstand at Wn27 Saint-Aubin-sur-Mer with the gun still in place showing what the 5cm KwK L/60 would have looked here at Langrune. The lookout now has been built over the original 1694-type ringstand. On the allied side, maps were made to show every eventuality. These were made from information from the French resistance, photo reconnaissance, frogmen and many other ways. The USAAF used Lightening as PRU's. 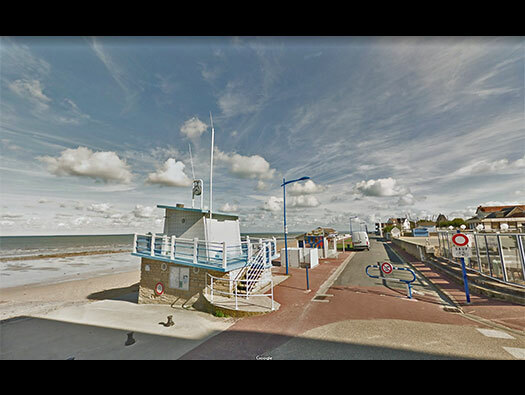 The landings took place both sides of Langrune, Sword beach to the east, 3dr British Div & 48 RM Commando and West, Juno with the 3rd Canadian Div & 40 RM Commando. 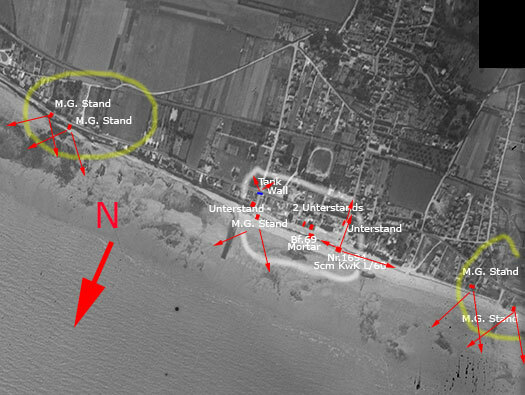 The Commandos were given the job of landing on both sides of each beach to secure the gaps in between. 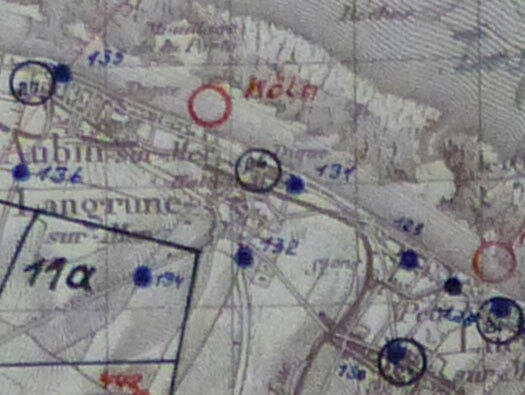 Here 48 RM Commando landed around Nan Red sector at 08:45 and moved inland to consolidate after a disastrous landing It was not until 12:00 before they could start their advance on Langrune. 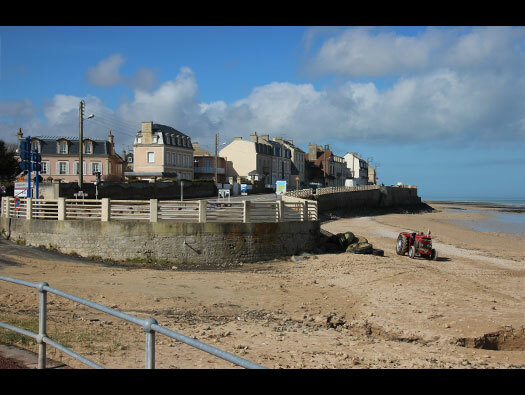 48 RM Commando moved parallel to the beach to Langrune fighting nearly all the way, they had to take Wn 27 Saint-Aubin-sur-Mer first. 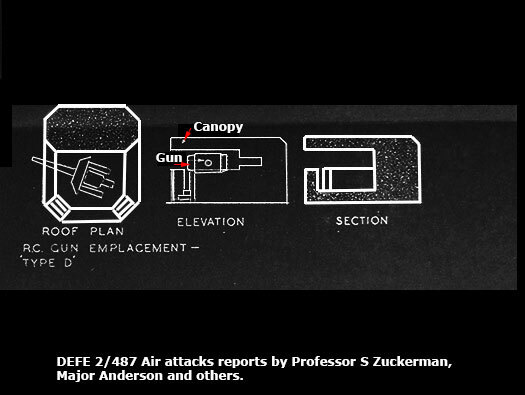 When the Commando arrived at Wn26 and started their attacke, they came to a halt very quickly. Then a Centaur 95mmÂ gunned tanks of the 2nd. 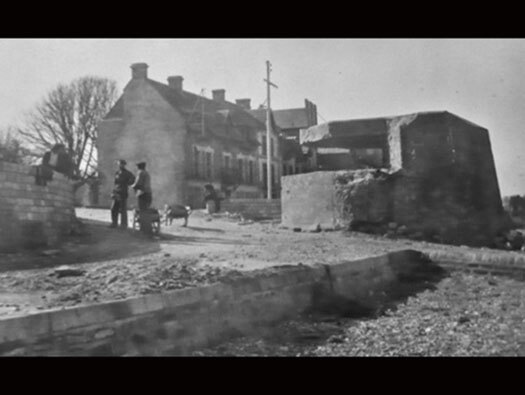 Royal Marines Support Group arrived and fired all its ammunition at the ten foot high, four feet thick. Their 90mm guns were only short range high explosives and did very little damage. The second Centaur ran over a mine and was disabled. 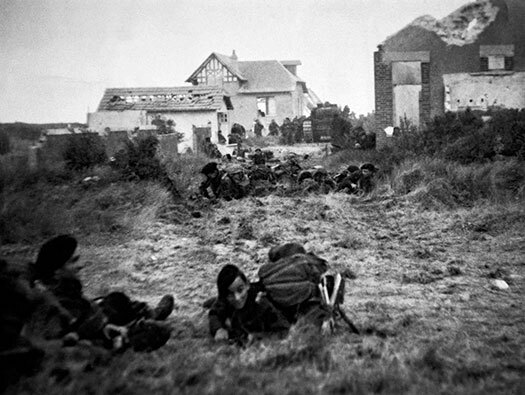 The Commando found they were too weak to take Wn26 (they had lost a lot of men on landing) that day and were ordered to move back and turn around and start to defend the area against an expected attack by Von Luck's Panzer's. Intelligence had informed them that a counter attack was likely to come in from the south at any time. The Commando moved south to a defence line covering any counter attack. 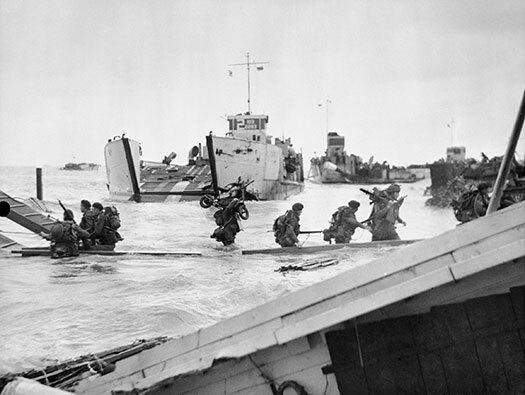 Next morning D+1 48 Commando turned around and started the attack on Wn26 again. This time with an M10 Wolverine tank destroyer. The attack started but the mined Centaur was in the way, a minefield was breached and that allowed the M10 to go forward forward. 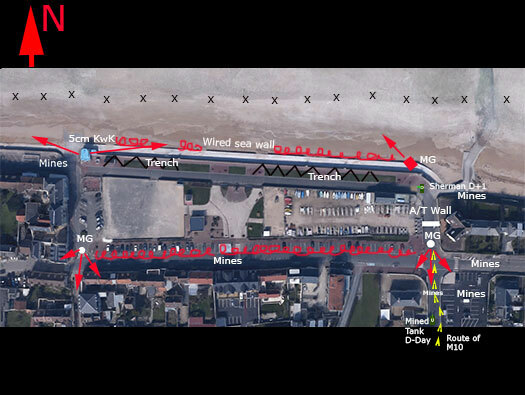 Plan of the route that 48 Commando took over the two days the fought there D-Day and D+1. The M10 Wolverine with Col. Moulton CO. of 48 RM Commando watching it moving forward. It fired all its solid shot and started to put holes through the A/T wall. 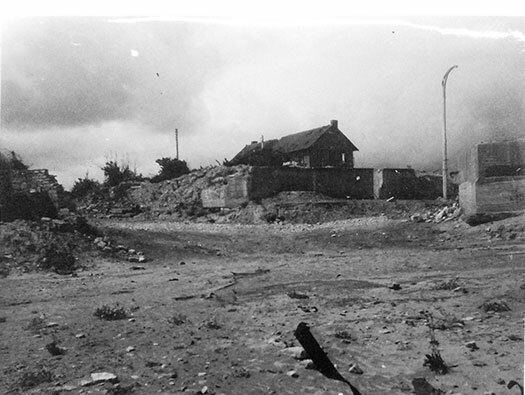 A Sherman command tank arrived and fired H/E shells and blew the rest of the wall apart. 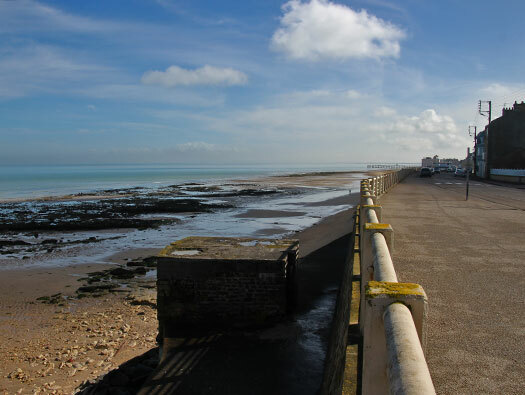 The Sherman tried to negotiate around the damaged wall and dropped into a trench but still managed to fire along the promenade. The defenders started to surrender. An M10 crawling through a French village. 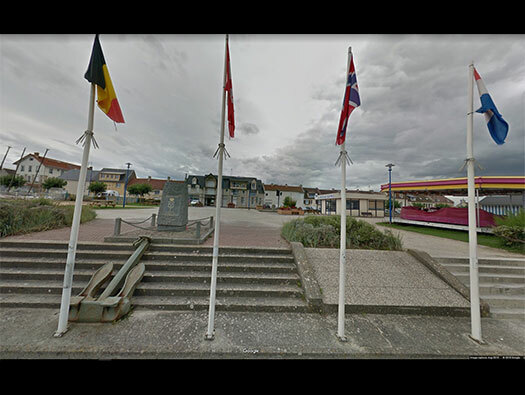 This may not be Langrune but it gives an idea of the D-Day devastation to the towns in France. 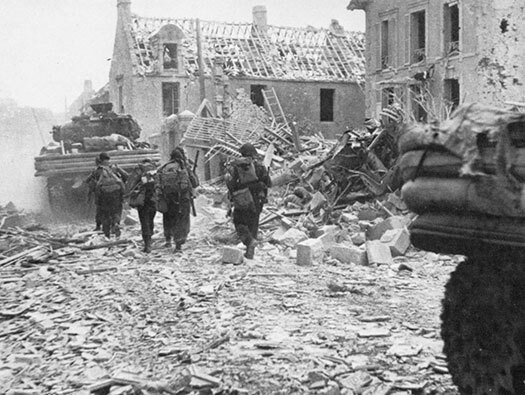 Here Sherman DD tanks working down the road as they would have an D-Day +1 to try and break through the anti -tank wall. 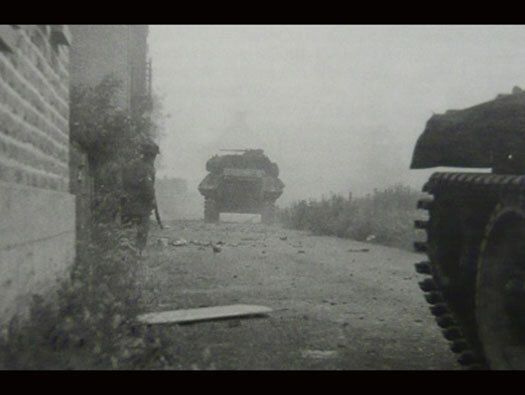 The tanks fired many shells into the A/T wall but it took men with pick axes and shovels to get through. The tank attack in support of 48 RM Commando's. The remains of the Gas Works wall in Langrune showing battle damage. 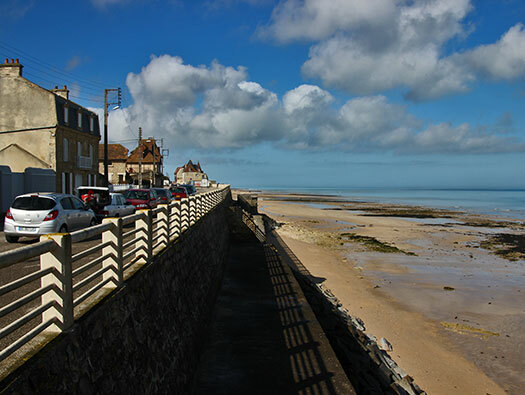 I would like to thank Jean-Pierre Gabriel for helping me with the extra details in and around Langrune-sur-Mer.